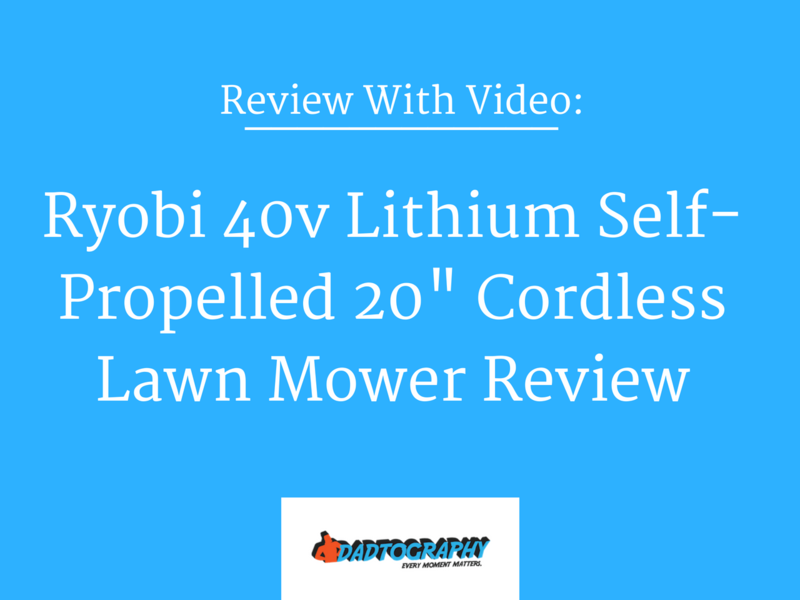 This is a 100% honest, 100% authentic Ryobi 40v Lawn Mower review. Dadtography was not compensated in any way for this post. All images and videos are Dadtography.com originals. Please don't use our photos without permission. My family and I just moved into a brand new house, and to say we made a sizable investment in tools and lawn equipment would be a bit of an understatement. One of the necessities we purchased was a new Ryobi 40 volt lawn mower. I've never owned an electric mower before, personally. I've lived next to neighbors that owned them - back in the day when they weren't cordless and you had to drag an extension cable around behind you. Wow did that look awkward and inconvenient! We were shopping at the Home Depot one day and saw this mower sitting on the shelf. We needed a new one, because of the move, and the price was the same as the gas-powered Honda we were considering purchasing. We decided to give the electric mower a try. Here are our thoughts as first-time electric mower owners. "Is it electric? ", they say with surprise. What are my first impressions of the Ryobi 40v Lawn Mower build quality? I have to say, there's something pretty cool about the way this Ryobi electric mower looks. To me, it looks futuristic and modern. I've only mowed my yard about six times with it so far, but I regularly receive questions about it from neighbors and people walking by. What kind of mower is that? Is it electric (they say with surprise)? How much did that thing cost? But let's face it - when it comes to mowers, the way it looks should really be at the bottom of the priority list. How the thing is built, how it performs and how durable and reliable it is are way more important characteristics. The Ryobi 40v mower has a good first impression, but after a few uses, I've also gotten to know more about how it's put together as well. The machine feels solid and well-built to me, although, I do have a squeaky wheel (nothing a little WD40 can't fix). What features does the Ryobi 40v Lawn Mower include? Okay, so maybe that was four reasons. Personally, I bought the mower because I also bought the 40-volt trimmer system as well. I wanted something that used the same battery. I'm not sure the "gas-like power" claim is quite true. 7-position, single-point height adjustment from 1.5 in. to 3.75 in. Is the Ryobi 40v Lawn Mower easy to use? I found the Ryobi 40v mower very easy to use. If you're familiar with self-propelled mowers, you should be able to hit the ground running wi this one. I say "hit the ground running" only half-jokingly. This mower seems fast to me - faster than the last gas powered mower I have. I'm used to mowing at full-speed, but I actually slow it down a bit with the Ryobi. I would say one of my favorite features is actually the single point adjustment system. You can actually adjust the deck height with one hand. You don't have to pry levers at each wheel like on some mowers. I am not a big fan of the "key" that's required to start the mower, but I get why it's there. I'm sure I'll lose it at some point. I store it in the compartment where the battery goes for now. I'm also not a fan of the load sensing technology of the mower. Yes, it works. If it senses too much of a load, it shuts the motor off and stops the blade. However, I've had the mower shut off before just from thick grass. I'm not sure the "gas-like power" claim is quite true. How's the battery life on the Ryobi 40v Lawn Mower? Okay, so I realize this isn't a review of the 40-volt 5.0 Ah battery, but this has been my biggest complaint so far. The normal battery will probably not get through most lawns in one charge but the 5AH can easily complete a lawn at least 1.5 times over. This has NOT been my experience with this mower at all. Have you seen the video I posted up above? I have a pretty small yard - a pretty typical suburban metro size. It can't be more than 5,000 sqft and this mower can't finish the job on a single battery. I'm glad / lucky that I purchased the trimmer system that uses the same battery or I wouldn't be able to finish my yard in a single evening (or morning). I'm not sure why my results are so much different than some of the reviews I read before I purchased. Perhaps it's the Florida heat. Either way, you shouldn't be required to purchase a 2nd battery to finish a yard the size of mine. Have you seen the video I posted up above? A few final thoughts and overall value assessment of the Ryobi 40v Lawn Mower. Overall, I think this mower is a good one. It's my first electric, so maybe it takes some getting used to. Electric mowers have come a long way since the days of dragging the cord behind you. Is this mower perfect? Of course not. It's got some great features, it's a bit pricey compared to gas mowers, but it's not the most expensive mower on the market. The battery life still bugs me. It should be able to cut a small lawn in a single battery charge. I would buy this mower again, but I would also be sure to buy the trimmer system or a 2nd battery as well. I hope it's durable and lasts a while. I'm used to Honda-powered gas mowers going for years. Longevity of the Ryobi 40v remains to be seen. What do you think? Do you own this Ryobi 40v cordless mower? Considering purchasing this or another electric mower? I'd love to hear your thoughts in the comments below!